A new pirate station, BOC HF RADIO was heard yesterday, August 30, 2013 on 6925 USB starting at 2310 UTC. 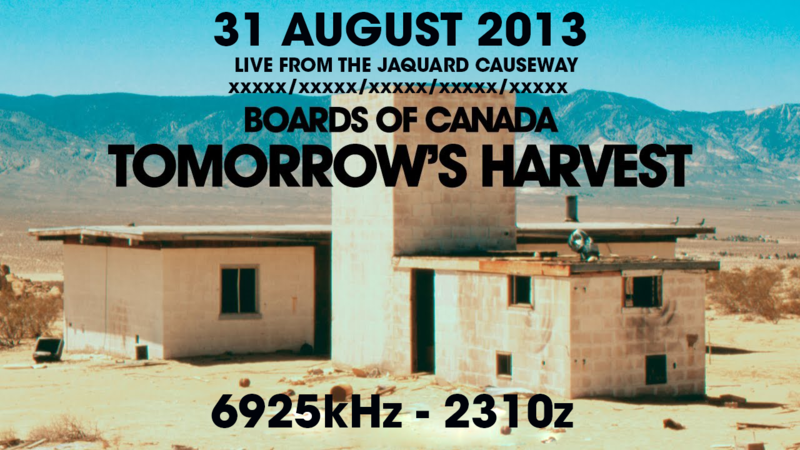 The station featured music from the electronic music band Boards of Canada. This entry was posted in Pirate Stations on August 31, 2013 by admin. CFRX 6070 is a station I frequently use as a reference to see how the bands, particularly 48 and 43 meters, are doing. Normally it is about S9+10. It was only S6 around 1800z today, it since has improved to S8 to S9 at 1930z. Another listener, in NH (so closer to CFRX) reports that they are barely moving the S meter there. If this continues, 43 meters may be near useless for close in (NVIS) reception, especially as the critical frequency falls later in the day. More distant listeners would still be able to receive signals, but the K index is presently 4, which is close to storm levels. 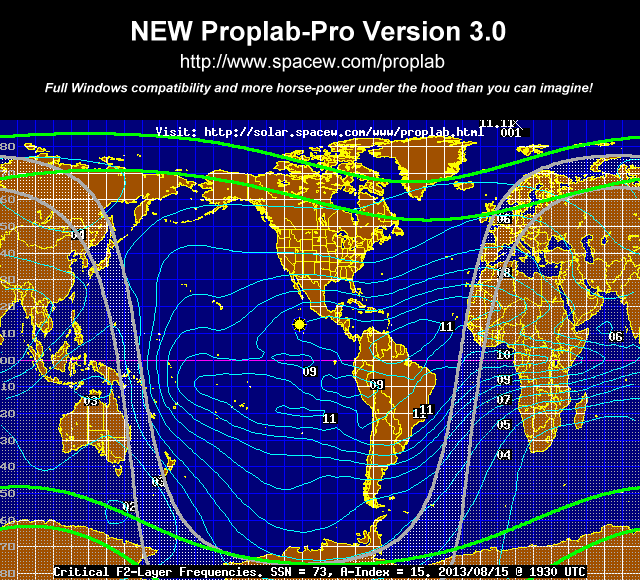 This entry was posted in Propagation on August 15, 2013 by Chris Smolinski. While I’ve had very good reception using my sky loop antenna, I wanted something that would have better low angle radiation sensitivity, for improved reception of distant stations. The sky loop is 670 ft in perimeter, and runs around the yard at a height varying between about 20 and 50 feet, depending on how tall the trees are. In order to get a better low angle radiation pattern, an antenna, for the 43 meter band anyway, should be higher. I don’t have two tall trees suitable spaced for erecting a standard dipole high enough for 43 meters. I do have one tall tree however, so I decided to consider a sloped dipole. The low angle radiation sensitivity is indeed pretty good, and there is some directionality as well. 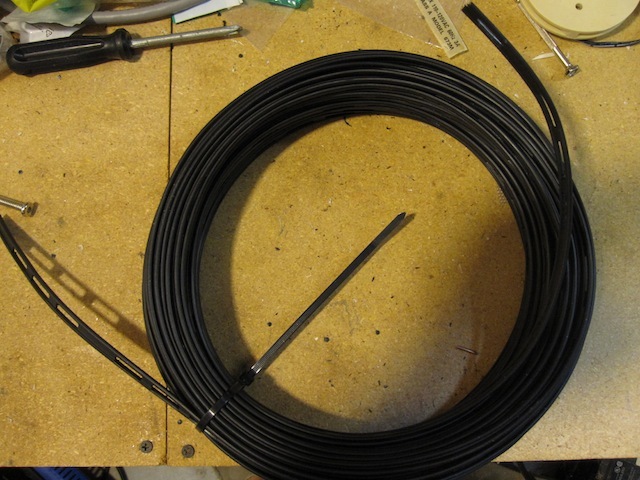 I decided to go with a folded dipole, as my previous experience with them has been good, they seem to share the common characteristic of all loop type antennas of not picking up a lot of local noise and RFI. The standard dipole formula was used, resulting in a length of 67 feet. 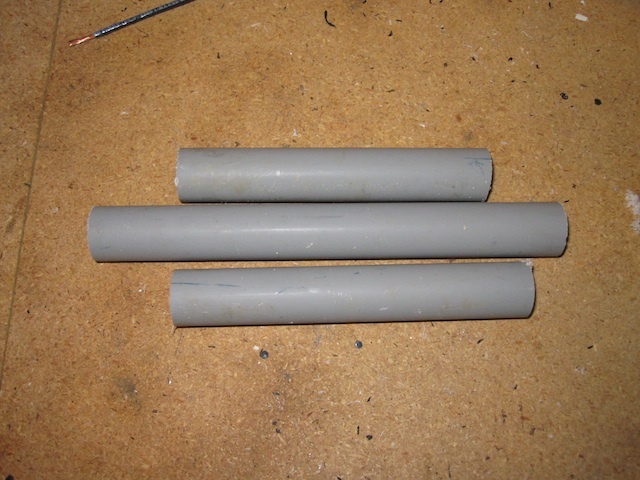 The two far ends of the ladder line have their insulation removed and the two wires are shorted together. I used nylon wire ties to secure everything. The high end of the antenna is at about 55 feet. the low end about 15 feet. 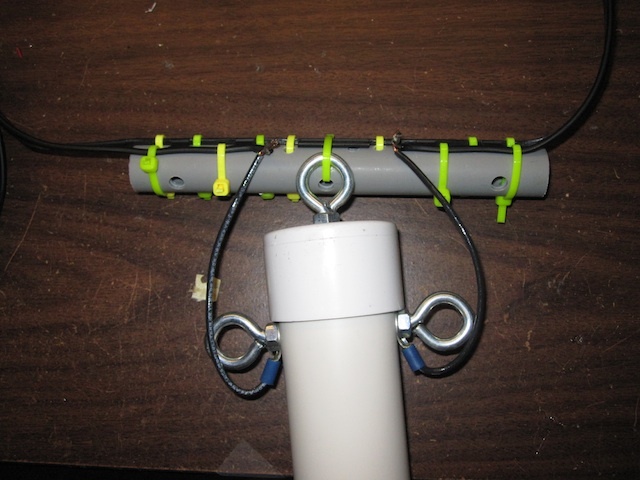 A rope is attached to the balun eye hook and goes over another tree, providing a little more mechanical support. For normal daytime reception, it works about the same as the sky loop on 43 meters. At this time of the day, propagation is NVIS, and the signal comes down at a high angle. I was not expecting much of an improvement here. Later in the day, results have been quite good, as I hoped. Late in the afternoon, I decided to try 6160 CKZN from St Johns, Newfoundland. With the sky loop, I barely had a carrier, while with the folded dipole, I had audio. 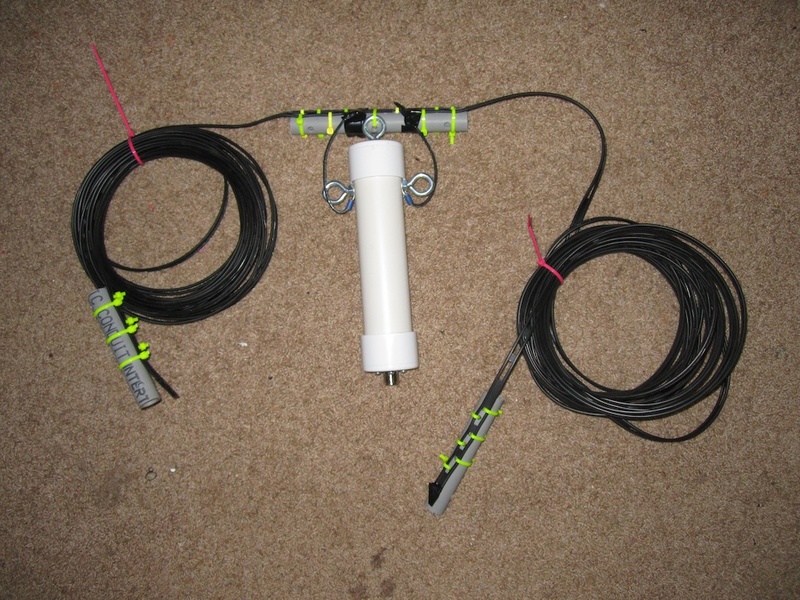 All in all I am quite pleased with the performance, and am switching to using this antenna for my overnight recordings on 43 meters. 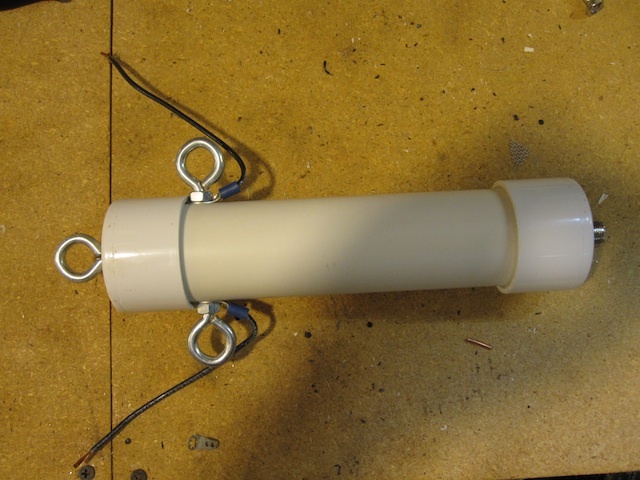 This entry was posted in Antennas on August 10, 2013 by Chris Smolinski. 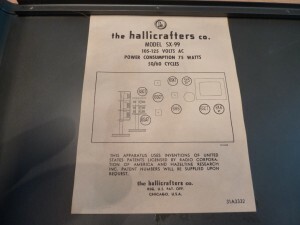 I have been happily turning mountains of electronic parts into scrap for nearly 50 years. 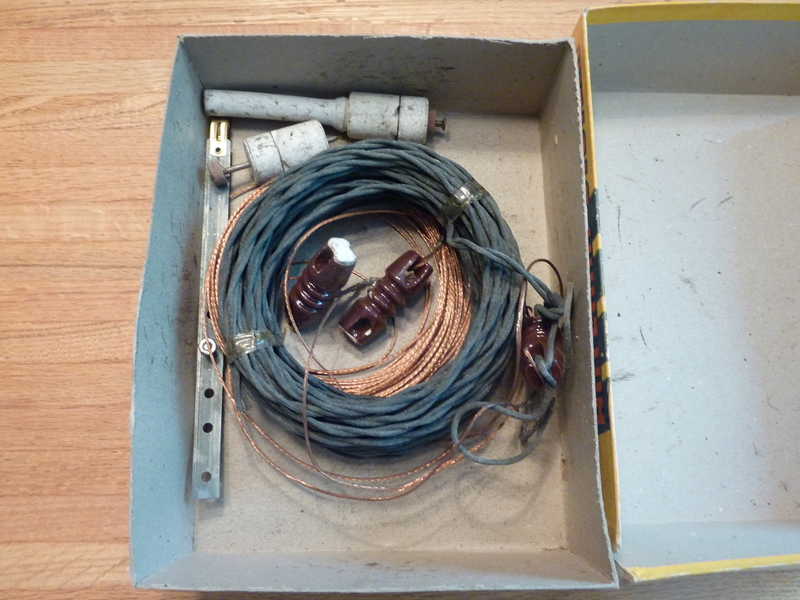 The quest for a well-performing, easy to build transmitter has greatly added to my slag heap. After much pleasure and pain, I am pleased to present to you, Dear Reader, a transmitter that satisfies both criteria. I offer you LULU… Back around 2000, Norberto, an Argentine ham, put together several existing concepts and came up with the basic LULU design. The LULU name is an affectation that came about in our builders group. It is easier than calling it “an LU8EHA variant” as it was known for awhile. We have made several changes to Norberto’s original design, but he would certainly still recognize it. 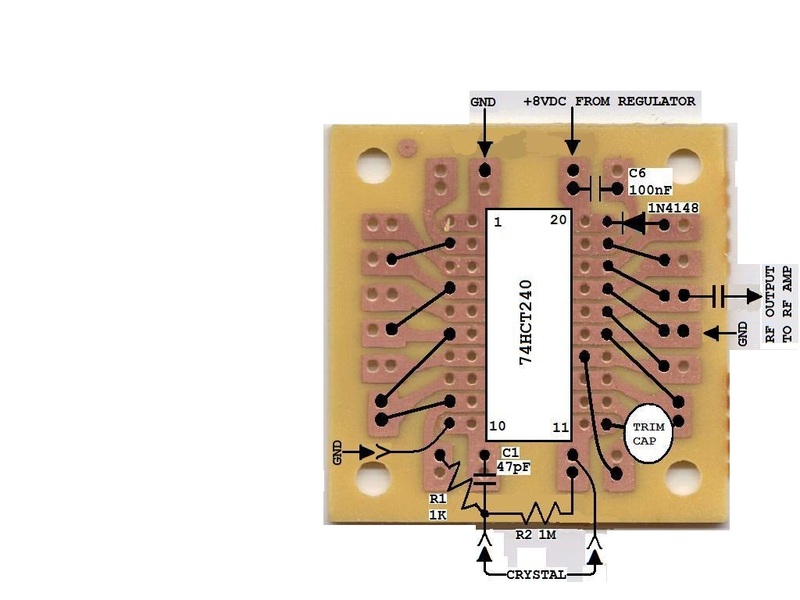 The heart of LULU is a 74HC240 octal buffer chip, which functions as an oscillator and driver. Its gates are tied together to increase its ability to sink and source current. Our active device is a MOSFET, which is turned on and off by swings of the input voltage. 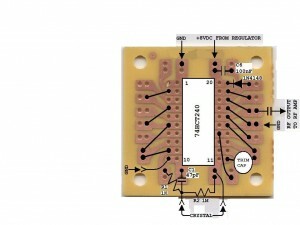 We will be powering our buffer chip beyond its design limits, from an 8 volt regulator. This begets a larger output voltage swing to the MOSFET than if we were playing by the manufacturer’s rules and powering the chip with 5 volts. The chip acts as a digital driver, switching the MOSFET on and off, with the RF waveform being rendered in the drain circuit. This digital method uses less parts, costs less, and generates less waste heat – advantage, LULU. At a basic level of understanding, MOSFETS are electronic switches. If a perfect switch is turned on, zero voltage appears across it and maximum current flows through it. If turned off, maximum voltage (the supply voltage) appears across it and minimum (no) current flows through it. Unfortunately, semiconductors aren’t perfect switches. The voltage and current are always a bit out of phase, due to the MOSFET’s input and output capacitances which fight voltage changes. These phase differences cause losses which manifest as heat. Switch mode amplification has been developed to eliminate most of these losses. LULU uses Class E amplifier topology to greatly enhance signal flow through the MOSFET. Constructing LULU’s final is straightforward. The given C8 value is nominal – it will get you into the ball park. C6 is not sacrosanct. Three 0.1uF (104) discs in parallel should work fine, but keep the value in the same zip code for best results. All capacitors after the MOSFET drain (RF output and modulated supply circuits) must be at least 100V or better. All resistors can be ¼ watt. 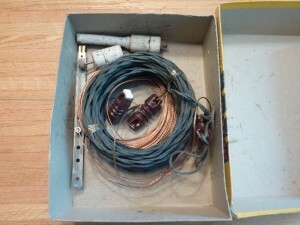 All coils are wound with #18 or 20 AWG. If you choose not to tweak, LULU will still work for you, but in Class C mode. This means that your output power will probably be less and your final will certainly run hotter. If you operate in this fashion, you MUST heat sink well. A fan might also be needed. Without tweaking, you should still see about 10 watts at the output. However, to unlock LULU’s real potential, you’ll have to tweak. The exact value of C8 will vary for differing IRF510s. Keep in mind that in Class E operation, the class E point does not always correspond with max output. Your efficiency tester will be your finger. You should be able to comfortably keep it on the MOSFET – even for 5 minutes or more. If you can’t, then keep tweaking. I often use a Mica trimmer (5-100pF, 300V) in place of C8 and tune for max output. Then finger test. If it runs too hot, try tweaking the capacitance a bit in each direction. You’ll eventually find a spot, near max output, that will also keep your finger happy. Measure the trimmer’s capacitance and replace it with a fixed cap. If you have a dual trace oscilloscope that will render well at 7 MHz, the MOSFET’s digital drive voltage at its gate will be “on” when its drain voltage is “off” and vice versa, more or less. This shows the almost perfect switch in action – maximum current through it when it is on and maximum voltage across it when it is off. IRF510s vary widely when used for RF. I have always coaxed at least 16, and sometimes as much as 22 watts out of them in this circuit. 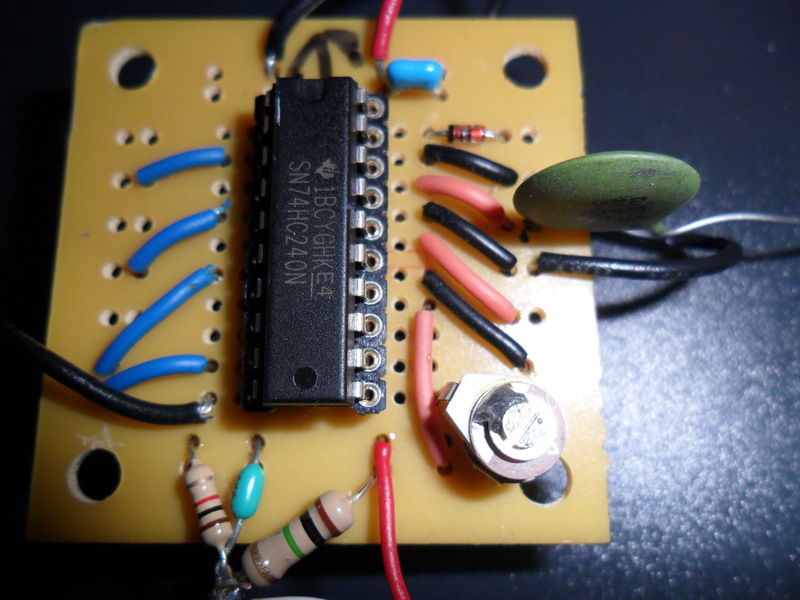 For CW operation: Feed the modulated voltage input from the 12 volt supply and insert the key between pin 1 of the 240 chip and ground. This will keep the oscillator gate running full time, while keying the driver gates on and off. For VFO operation: This input is included for frequency agility. If you use an outboard frequency source, its output should be about 8Vp-p, to keep the 240 happy. If unwanted, eliminate the switch and R4, and attach pin 11 directly to the crystal/R2 junction. A switch mode transmitter like LULU is inherently narrow banded. 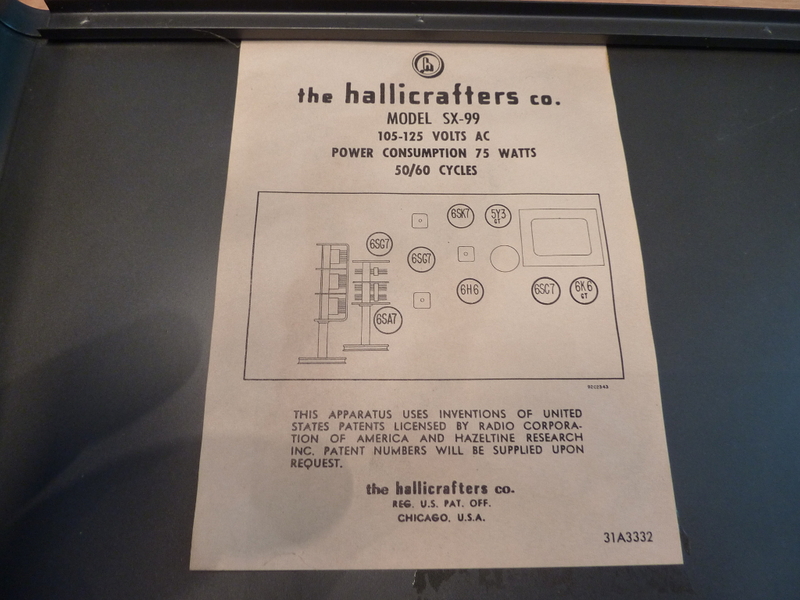 Operation should be limited to about 50 KHz either side of your tweaking frequency. So build patiently and I hope you have some fun putting LULU together. I will discuss AM operation in a later post… 73! This entry was posted in Pirate Radio, Pirate Stations, Transmitters on August 6, 2013 by Fearless Fred. Neither of us managed to get an ID, the signal was simply too weak. Another listener in Australia let the op of the station know about the logging thread on the HF Underground. 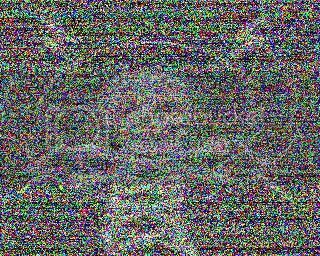 I suspect the SSTV image helped a lot in identifying what we had heard. The op then joined the thread, and identified for us what we had heard, Radio Totse, from New Zealand. So while the received image was indeed quite poor, it was certainly sufficient to identify what station we were hearing. This let me to think about modes such as SSTV could be utilized by operators to help listeners identify what they are hearing. The received image was so poor that the text in the image was completely obliterated. But the overall image was recognizable. This SSTV transmission was made using Scottie DX mode, which is one of the slower SSTV modes. By slower I mean that each pixel takes longer to send, making it more robust under poor signal conditions. Hence the DX part of the mode name. If Scottie DX mode is not used, it is probably important to choose another commonly used mode, such as Scottie 1, to make it more likely that listeners will be able to decode it. 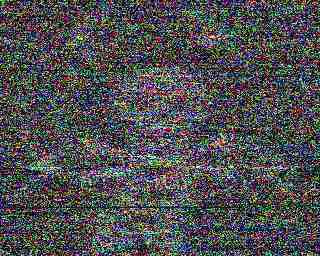 Often when conditions are poor, manual triggering and selection of the SSTV mode is required. There’s too many SSTV modes to go through them all, guessing. Also, slower modes should be favored whenever possible, to increase the signal to noise ratio of the received image. The fastest monochrome mode I am aware of is the Robot 36 second mode. Another image mode that could be utilized would be FAX. Scottie DX takes about a second to send each scan line, whereas fax mode takes half a second. But Scottie DX is a color mode, so the red, green, and blue components of each pixel are sent separately. Each color scan line taking about a third of a second. A fax scan line takes slightly longer to send, which may help under poor conditions. On the other hand, the fact that each color component of a pixel in Scottie DX mode is send three times, with a third of a second delay between components, may provide a time diversity element that helps improve reception. A third image mode is Hellschreiber. In this mode, text is sent as raw pixels rather than ASCII values. Each pixel is sent twice, for two lines of text, again providing some time diversity. It can perform fairly well under poor conditions, with the human brain acting as the “DSP” to decipher what is being received. Periodic identifications could be made in Hellscreiber mode, aiding in identification of the station. There is of course also CW mode. CW is one of the most robust modes, cutting through the static when other modes fail. And it’s not necessary to use any additional equipment to decode CW, just what is between your ears. (In fact a major downside to CW is that most software decoders for morse code are actually quite poor, compared to the human brain. CW is simply a very difficult mode for software to decode) The downside, of course, is that you have to know morse code, something that many listeners don’t. There are several pirates already that do send short CW IDs, Blue Ocean Radio for example would often send “BOR” in CW, which was very recognizable, even to those of us who are not extremely proficient at CW. Shorter is probably better with CW IDs, sending an abbreviation of the station name when possible, to make it more likely that listeners without advanced CW skills will be able to decode it. Finally another digital mode that could be used is PSK31. PSK31 is also quite robust, and the software decoders for it are generally both quite good and readily available. It’s a fairly fast mode, several characters per second typically, so station IDs along with contact information (email address, for example) could be periodically sent. For some time I have wondered if PSK31 could be transmitted continuously as part of the program audio, but at a reduced volume, so that it did not interfere with the programming, but was still strong enough for software to decode. 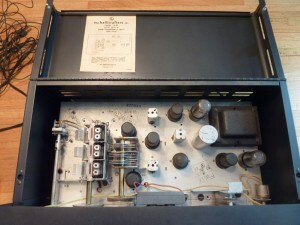 It coul dbe treated as a sort of RDS for pirate radio, continuously transmitting text that included the station name, contact instructions, as well as information about the music being played, current programming, etc. Some experimentation would be required to see if this was indeed feasible, and what the optimum PSK31 frequency would be (it may not be the standard 1000 Hz). Operators could use one or more of these modes to increase the probability that listeners will be able to identify what station they are listening to, and make it more likely that they will be able to contact the station. This provides benefits for the operator as well, since they will get more feedback about their broadcasts. Certainly a win-win for everyone. This entry was posted in Pirate Radio on August 5, 2013 by Chris Smolinski. 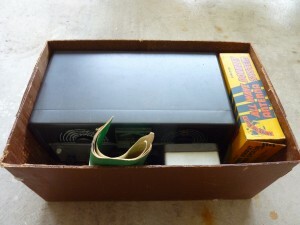 My yard sale find. Let me show you it. “It’s a ham radio!” exclaims the middle aged guy running the sale. “How much?” I ask. “$20″. I bargain on everything. So my counteroffer of $15 was accepted. And off I go to hump the box back to the truck much to the puzzled consternation of Mrs. Beerus. So, what’s in the box? 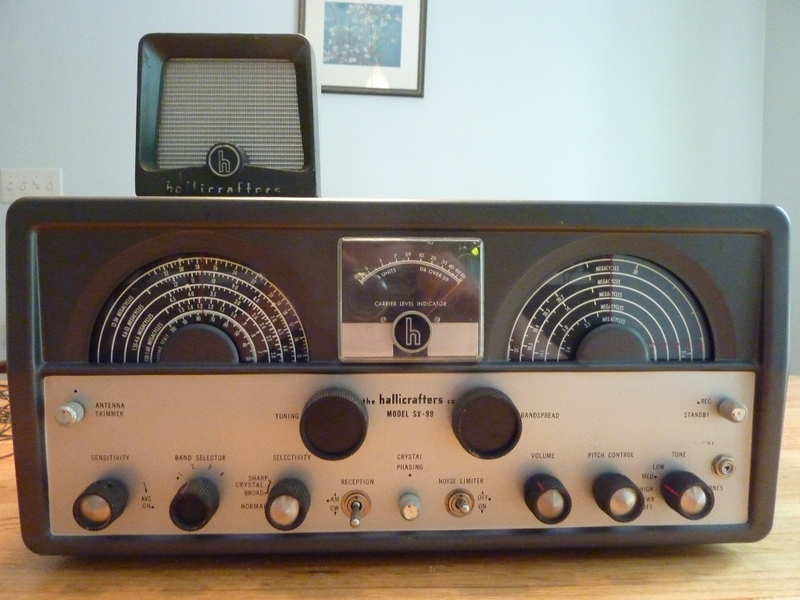 Well, it’s a pretty mint Hallicrafters SX-99, with a speaker, and a doublet antenna still in the box. You might notice the silver knob inserts missing from several knobs; I have those, and just need to glue them back in. They fell out when I took the radio out of the box. The inside of the radio is complete, and very clean! 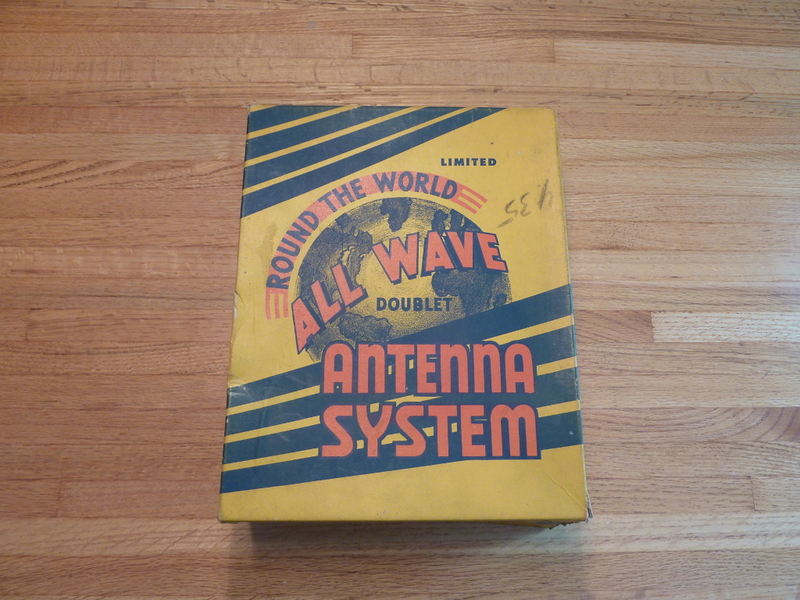 This antenna box has some 1950’s panache. The antenna copper itself has no tarnish and the twisted pair feedline is still taped up like it was from the factory so I don’t think this antenna was ever hung. 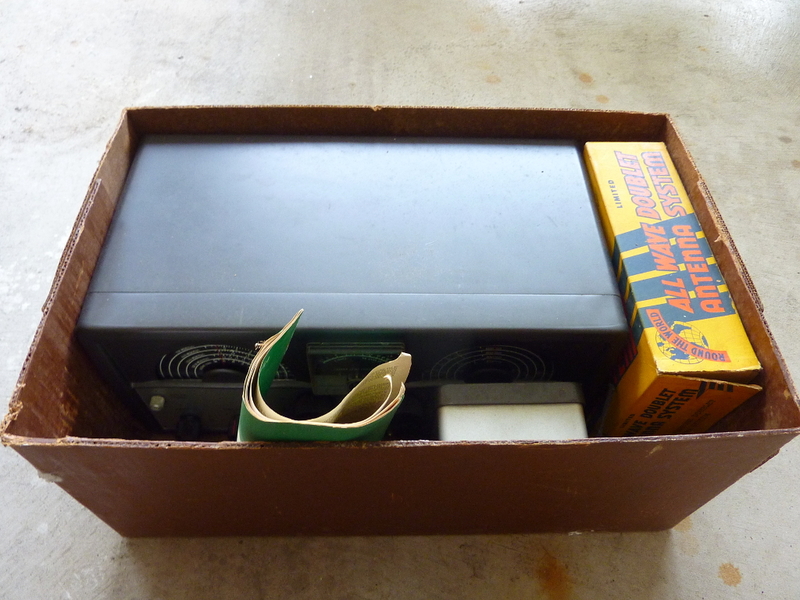 This entry was posted in Uncategorized and tagged hallicrafters, sx-99, yard sale on August 4, 2013 by Beerus Maximus.